You arrive in Paris in the morning. You will take a bus in from Charles de Gaulle airport which lets you off directly across from our splendid and opulent hotel, the Le Grand Hotel Intercontinental. After resting and relaxing, we will meet in the lobby in the early afternoon and walk to a welcome lunch at the Fauchon Restaurant at Place de la Madeleine. 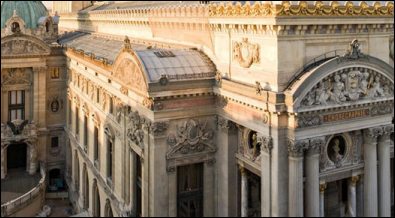 We will then do a walking tour of the Right Bank, including Place de la Concorde, Rue de Rivoli, Place Vendome and end up on rue Faubourg St. Honoré, near la Maison Hermès. If you wish, we may stop in the Montale Parfumerie on Place Vendome! Evening dinner is on your own. Up early today for the sale! We will take a cab to the sale venue, which is not at the boutique. Be prepared to wait in line. s depending on HOW early you want to get up! You will take a cab back to the hotel on your own after shopping. Afternoon is free. 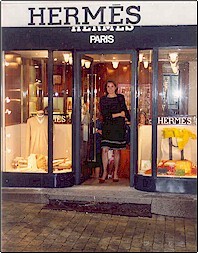 After breakfast we will metro over to the new Hermès boutique on the Right Bank! It is a very modern shopping experience and there is a café for light pastries and coffee, salads, and sandwiches! There's also a small floral shop! Afternoon and evening are free. After breakfast, we will take the Metro to the Arc de Triomphe on the Champs Elysees and walk down. Those who wish to stop in the Louis Vuitton flagship store, and the Guerlain Mother boutique may do so. 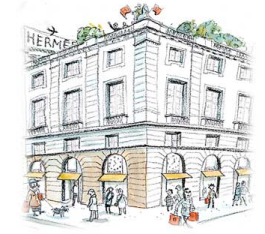 We continue on and those who wish may go to the third small Hermès boutique on Avenue George V.
As a group we will move down to the exclusive shops on Avenue Montaigne. After shopping at your leisure, we will meet as a group to metro back to the hotel. Lunch will be on your own during this time. We will meet at a pre-appointed time to metro back to the hotel. I will assist you in getting on the return bus to Charles de Gaulle Airport. I will give you detailed instructions for claiming your detaxe refund at the airport. You will return home with lots of lovely treasures and memories!